Last week while on our morning walk in the neighborhood, I noticed this tall stately palm in a different way. The angels nudged, look at the road, see the tall silhouette it casts on the pavement. 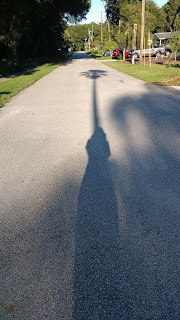 I laughed as I came up higher in my own thought walking a straight narrow line on the palm's shadow. Later, I learned more about the palm tree. It is associated with cherubim in the Bible. The regal palm, unlike other trees, doesn't branch out in many directions. Rather it grows strong, straight up. Turns out that the elasticity of its trunk keeps it flexible so it can easily bend down low during a storm to keep from breaking. Have a joyful day with your Angels and remember to bend a little to keep your peace. Happy Autumn Equinox! Welcome Archangel Michael!